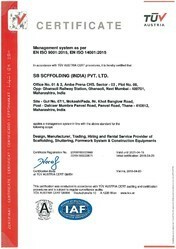 Shree Bhairavnath Scaffolding & Engnn (saarvi Group), one of the leading manufacturers, distributor, wholesaler, trader and suppliers of this impeccable range of Scaffolding Products, established its operations in the year 2012. The range made up of the finest Scaffolding Products, Construction Scaffolding Pipes and Scaffolding Fittings, is widely praised. This ensures the product’s strength, durability, and performance. In addition to this, we provide the finest Building Washing Services, priced reasonably. The infrastructural facility at Shree Bhairavnath Scaffolding & Engnn (saarvi Group), is widely praised for the sophisticated machinery and equipment present. This helps us in the attainment of a number of the firm’s predefined goals and targets. For reasons of managing the firm’s operations in the best possible manner, the facility has been parted into several highly operational units. These units help us in the attainment of greater productivity. Our huge client base comprising Basf India Limited, Agnice Fire Protection Ltd., High Parra Construction Pvt. Ltd., is owed to our ethical work practices. Further, the facility is regularly upgraded, for reasons of boosting our market standing. Under the leadership of Mr. Santosh N. Chaskar, our Manager, attainment of success is quite easy. His understanding of the market and managerial skills are the key ingredients, in our success story. Further, he provides regular perks and benefits to the employees, for reasons of keeping them motivated. 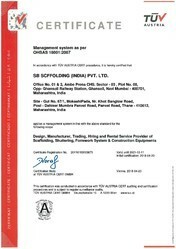 Trading of Shuttering and Scaffolding Systems. Our aim is to provide prompt & efficient services without compromising on quality of material. We have a team qualified civil engineers & dedicated marketing professionals. We have a vast client network in Mumbai, Navi Mumbai, Thane & Pune. We look forward to have a long term professional relationship with our customers. We are manufacturer of following products which are also available on hire and rental basis. We have employed a team of diligent professionals, which carries out all the business activities in a systematic manner. These professionals are aware of the methodologies and techniques to use latest tools and machines. Moreover, we organize various training sessions and workshops to keep them abreast of the advancements and set industry norms related to our domain. They work in close-coordination with each other to accomplish the set objectives of the organization within the promised time-frame. B.E. (Civil) from Mumbai university. Started career in 1994 as execution engineer with a dream to build homes for homeless people. To provide quality homes at right price. To keep time & cost factor intact, to complete the project within stipulated time. Having 12 years experience in the civil engineering industry. A Master mind administrator. His knowledge & experience ensures smooth running and administration of the company. We are OHSAS certified company. Kc Power Infra Pvt. Ltd.
Super Fire Engineering Pvt. Ltd.